Bertrand Piccard and André Borschberg, the founders of Solar Impulse have successfully arrived in our nation’s capital with their solar-powered airplane. The welcoming community waiting on the tarmac when they landed gave them a flag. Bertrand and André have given a Clean Generation flag to each community in which they landed that was a scheduled stopover. This banner from the Washington DC community was a lovely reciprocal greeting. Today, the two founders of this highly successful and well received solar aircraft were presented the highest award the Solar Energy Industries Association (SEIA) presents. US Energy Secretary Ernest Moniz and Swiss Ambassador Manuel Sager were in attendance for the award ceremony. Details follow in the press release from SEIA. WASHINGTON, DC – In recognition of the first ever intercontinental flight by a solar-powered airplane – as well as its historic flight across the United States – the Solar Energy Industries Association (SEIA) presented its 2013 Innovators-of-the-Year Award to Dr. Bertrand Piccard and Andre Borschberg, co-founders and co-pilots of Solar Impulse. The presentation was made today during a press conference at the National Air and Space Museum at Dulles Airport, which was attended by US Energy Secretary Ernest Moniz and Swiss Ambassador Manuel Sager. 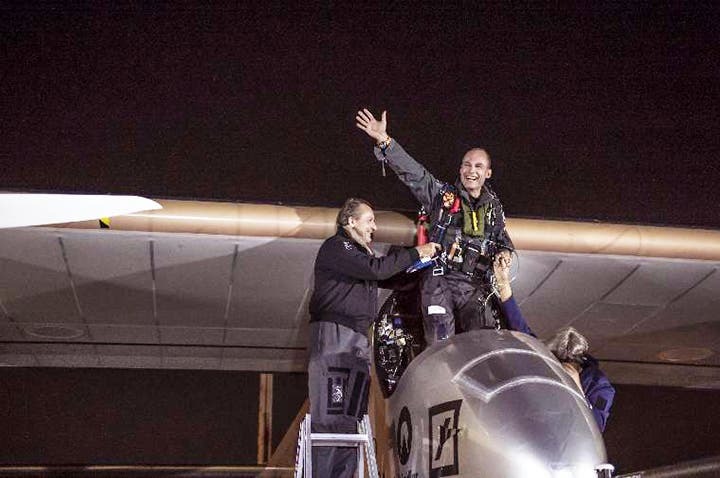 Solar Impulse arrived in the nation’s capital following a highly-publicized journey across the United States. Considered the most advanced solar aircraft in the world, Solar Impulse is the first airplane ever to fly day and night without fuel or polluting emissions. With its 12,000 silicon solar cells – designed, developed and manufactured by SEIA member SunPower of San Jose, CA – Solar Impulse is also equipped with state-of-the-art batteries that store power, allowing it to fly around-the-clock – something which has never been done before. In 2015, Solar Impulse will try to become the first solar plane to fly around the world. Today, solar is one of the fastest-growing industries in the United States, providing good-paying jobs for nearly 120,000 Americans at more than 5,600 companies, many of them small businesses. There is now more than 8,500 MW of cumulative solar electric capacity in the United States – enough to power 1.3 million American homes. What’s more, in the first quarter of this year, solar accounted for 48 percent of all new electric capacity installed in the US. Author’s Note: Bertrand and André are thrilled to be in Washington DC with their prototype aircraft, which has exceeded their wildest expectations. From here, they will fly to New York to complete their Across America 2013 mission. 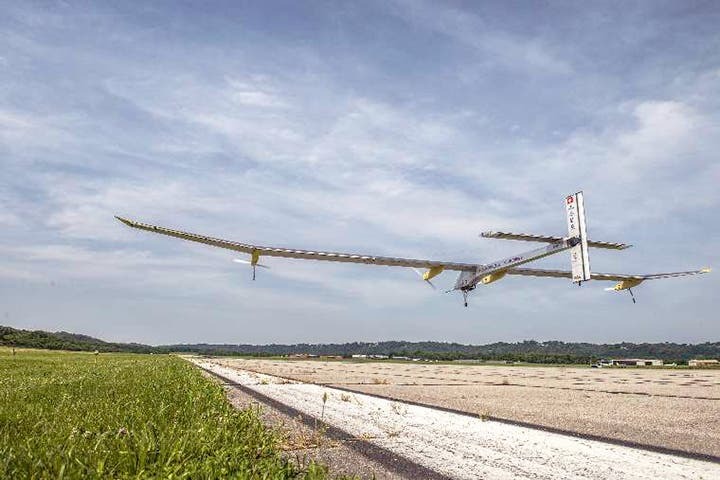 André will pilot the solar plane for the last time on this final leg of their historic journey. The flight to Washington DC was Bertrand’s last flight in the cockpit of HB-SIA. Their next adventure is planned for 2015 when they launch the mission to become the first solar-powered airplane to circumnavigate the globe. We wish them well; God Speed and we’ll miss the excitement of their breathtakingly beautiful flights! Tags: across america, award, Bertrand Piccard and André Borschberg, Clean Generation, Dulles International Airport, Ernest Moniz, flag, founders, good-paying jobs, June 16, National Air and Space Museum, Rhone Resch, San Jose, Secretary of Energy, SEIA, silicon solar cells, solar aircraft, solar airplane, solar impulse, Swiss Ambassador Manuel Sager, the Solar Energy Industries Association, top innovation, U.S. Energy Secretary, Washington D.C.